Portsmouth Police Chief Robert Ware, back row, second from end on the right, was among those law enforcement leaders to receive a platinum safety award from AAA. The Portsmouth Police Department and Police Chief Robert Ware were among 14 police departments Tuesday to receive the American Automobile Association’s East Central “Platinum” safety award for what was described as their outstanding efforts to increase road safety for all motorists. An additional eight departments were honored with Gold and Silver awards. In a press release, AAA officials said the Platinum awards were given to “Commendable Leaders” for their safety efforts and enforcement activities geared towards making communities safer. 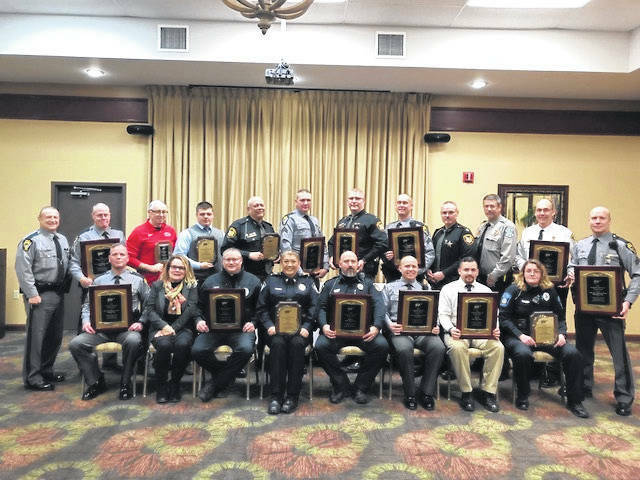 Besides Portsmouth, the Ohio recipients of the Platinum awards were police departments in: Chillicothe, Hillsboro, Piketon, Waverly and Wellston. The Jackson County Sheriff’s Office also was given the award; and Ohio Highway Patrol Posts in Chillicothe, Gallipolis, Georgetown, Ironton, Jackson, Portsmouth and Wilmington. AAA spokeswoman Lynda Lambert said platinum winners needed to submit a proposal to address a specific safety or traffic problem in their jurisdiction. Local officials must track the success of their initiative and report it to AAA for at least three years. Lambert did not readily have details as to what initiative was undertaken by Portsmouth police. Attempts to reach Ware for comment were not successful. AAA East Central is a not-for-profit association with 80 local offices in Kentucky, New York, Ohio, Pennsylvania and West Virginia serving 2.7 million members. News releases are available at news.eastcentral.aaa.com. Those interested can follow AAA on Twitter and Facebook. https://www.portsmouth-dailytimes.com/wp-content/uploads/sites/28/2018/12/web1_AAA-police-pic-2.jpgPortsmouth Police Chief Robert Ware, back row, second from end on the right, was among those law enforcement leaders to receive a platinum safety award from AAA.